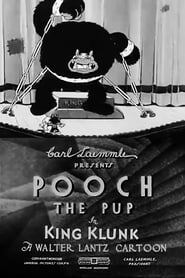 Pooch the Pup takes his girlfriend and an anthropomorphic camera to the jungle in search of the giant ape, King Klunk. They arrive just as the Hot-Cha tribe is offering one of their own girls to the ape as a sacrifice. King Klunk tries to bite down on her head, but even his enormous fangs can’t make a dent in her hard skull. His attention turns to Pete the Pup’s girl, whom he snatches up in his huge hand. The ape doesn’t know what to make of her until Cupid hits him with an arrow. Suddenly, King Klunk is in love. He even battles a dinosaur to prevent her from getting devoured. During the fight, Pooch takes the opportunity to rescue her. After winning his battle, the ape takes after the fleeing pair, but they defeat him by cracking a giant egg over his head. Soon, Pooch and his girl are exhibiting the giant ape in a big-city theater. Mischievous Cupid reappears to reignite the ape’s passion for the girl.